The Early County Museum is located at 226 North Main Street in Blakely. North Main Street was Cuthbert Street when Cook's Dry Goods store was open for business serving Chero-Cola. During the renovation of the Early County Museum, volunteers uncovered a reminder of those long ago days. While removing loose plaster from an interior wall, a brick wall with painted advertising was uncovered. According to information found in a study of Blakely's old brick buildings by A. J. Singletary, the signs are believed to occupy the outer south wall of the original Cook stores built in 1908 by W.C. Cook at what was then 243 Cuthbert Street. The buildings the museum occupies are believed to have been added onto the original building in 1925. The addition was possible after fire destroyed the adjoining Cook residence. The Early County Historical Society, along with Blakely Home Town, is leading the museum renovation and development effort. 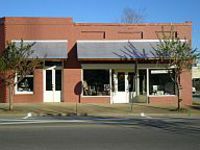 The museum consisted of three buildings on North Main until recently when the Blakely Rotary Club purchased a fourth building for this worthwhile project. (229) 724-7222. Make sure you visit our gift shop while you are here. The park museum is partially situated inside an excavated mound, providing an unusual setting for viewing artifacts and a film. The park hosts the Kolomoki Indian Festival on the second Saturday in October each year. This unusual park is an important archaeological site as well as a scenic recreational area. 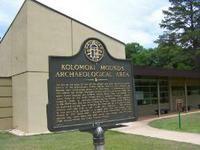 Kolomoki Mounds State Park has swimming, fishing, boating, miniature golf, picnicing and camping facilities. Kolomoki Park contains seven mounds that were built between 250-950 A.D. by the Swift Creek and Weeden Island Indians. Included among the seven mounds are Georgia's oldest great temple mound, two burial mounds, and four ceremonial mounds.